National Service is the name given to the compulsory conscription in Singapore of all male Singaporean citizens and second-generation permanent residents upon reaching the age of 18. They serve a two-year period as Full Time National Servicemen (NSFs) in the Singapore Armed Forces (SAF), Singapore Police Force (SPF), or the Singapore Civil Defence Force (SCDF). When a conscript completes his full time service, he is considered to be "operationally ready", and is thereafter known as an Operationally-Ready National Serviceman (NSman). On an annual basis, NSmen go through either a high key training or a low key training until they reach the age of 40 or 50 depending on their rank. The overwhelming majority of conscripts serve in the Army, as part of the SAF. 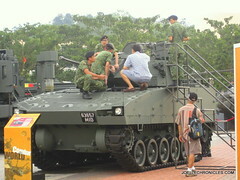 The Singapore Army is holding an open house at the Pasir Laba camp from this Thursday till September 3rd 2009. 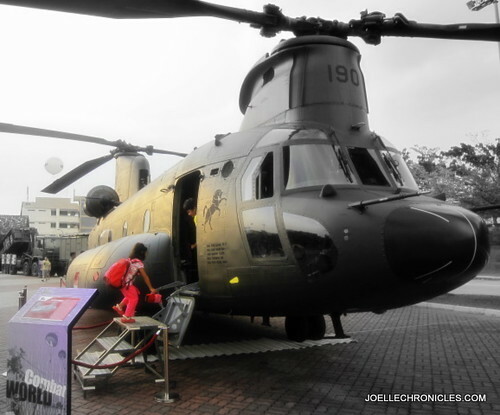 AOH 09 serves as a showcase of the Army to the Singapore public, providing a chance to learn more about the Singapore Army's new fighting concepts and capabilities. In the event of the breakout of war in Singapore, NSmen will form the bulk of the defending forces under the SAF. Activities such as these are deemed important for those who do not serve in the military as it enables them to see what they do and understand what their families go through. We can only hope that none of our children will ever experience the horror and devastation of war.